Take your salad to a whole new level of gourmet with this salty, spicy sunflower, sesame, and pumpkin seed salad topper! Add some crunch, protein, healthy fats and even more nutrients to your next salad, soup or baked potato or squash. This combo of seeds is salty and spicy and elevates a salad to gourmet status. Keep a jar in the freezer to maintain freshness and to have it ready whenever you are! 1. Cover baking sheet with parchment paper, or use a stoneware baking sheet. 2. Combine the seeds and seasonings in a large bowl, stirring well. Taste and adjust seasonings if desired. Spread out evenly onto baking sheet. 3. Bake approximately 15–25 minutes stirring after 10 minutes. Let cool and store in glass jars. Store in the refrigerator in an airtight container for up to 3 weeks. Sliced almonds, pecans, pine nuts or walnuts etc. 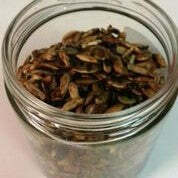 are a great alternative to the seeds and additional spices or dried herbs can be used as well. Check out the health benefits to pumpkin seeds!